Excel Agri aims to make the world more colorful with strawberries. I worked in a IT company before, but I knew I wanted to work in the field of agricultural for a long time, so I resigned and started my brand new career in this industry. Now I cultivate rice, strawberry and some vegetables for restaurants, deliver my agricultural products to customers almost directly. At the same time, I cooperate in Shanghai and carry out a project to produce and sell strawberry　and rice in the mainland China. Besides, I make desserts using my vegetables and fruits in Japan and export them to Southeast Asia such as Hong Kong, Taiwan and Singapore. 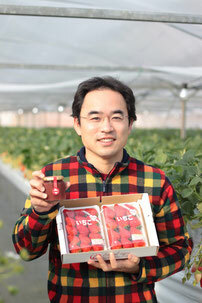 Excel Agri aims to make the world more colorful with our Japanese high-quality fruits and vegetables, advanced agricultural techniques and also the delicious strawberries. Copyright © Excel Agri All Rights Reserved.